4/16/2009Share this story on Facebook! See video of a paper-cutting workshop led by Pamela Mei-Leng See. FLEFF has long been cutting edge, but this year it went interactive. Festival organizers introduced FLEFF labs: interactive activities led by filmmakers, musicians, writers, visiting fellows, digital artists and other FLEFF guests. The labs gave festival goers the opportunity to step out of the role of observer and create something in their own right. As part of the popular Syncopation Lab, Cornell University graduate student and media artist Nick Knouf demonstrated circuit bending, an experimental art form involving a Dr. Frankenstein-like approach to manipulating electronic devices. Knouf showed lab participants how to disassemble children's toys and rewire their noise-making components to make new, more "interesting" sounds. Media artists Arzu Ozkal-Telhan and Claudia Pederson collaborated with Knouf on this lab. Audio slideshow by Nick Deel '09 with photos by Allison Usavage '12. At a "Brown Cloud" paper-cutting lab led by Beijing artist Pamela Mei-Leng See, students experimented with paper-cutting techniques while See explained this ancient Chinese art form. 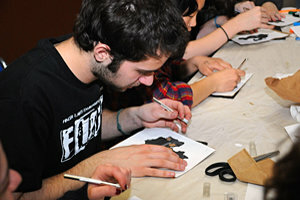 Cinema and photography major Daniel Sitts '12 tries his hand at Chinese paper cutting. Photo by Allison Usavage '12. The lab was inspired by the pollution problem in Beijing; clouds of smog often obscure the skyline for days in the heavily populated city. See has been traveling around the world with Brown Cloud Project in order to bring the issue to the forefront of people's minds. Each participant's paper cloud will become part of the overall project.